Mr. Costello earned a degree in business from Loyola University in Los Angeles in 1983 and Management Development Program UC Irvine in 2005. Mr. Costello currently is Corporate Vice President of Business Development for Security/Defense and Government Relations, where his responsibilities include developing and implementing strategy related to forward looking technologies, markets, as well as promoting Microsemi's technology roadmap. These markets include information assurance, anti-tamper technology, advanced weapons systems and satellite payload applications where security and reliability are paramount. He is responsible for Microsemi's major initiatives involving Government Relations including the acquisition of “Trusted” microelectronics and GPS denial mitigation solutions. Executive Hoodlum: Negotiating on the Corner of Main and Mean by John Costello with Larry Elder is a thought-provoking and engaging true story like nothing I’ve ever really read before. Personally, I always veer towards non-fiction stories, but as I read this book, I found myself forgetting that in fact it was not fiction. Through the personal struggles growing up and throughout his early adulthood, the challenges he faces with his family, towards his accomplishments as a businessman in a highly successful industry, the story gives the reader perspective that anything is possible if you strive for it, and work hard enough. For many, John’s upbringing and family life would perhaps define their future, but this story is why non-fiction stories really tug at your heartstrings, because they demonstrate triumph over obstacles. What I mostly enjoyed about John Costello’s story is that I was brought into both worlds, but like a crime novel, you have an exciting mix of mobsters, crime and greed on the streets of Chicago, mixed with the corporate world with senators and executive antics. I felt hooked by every page, and I didn’t want the story to end. 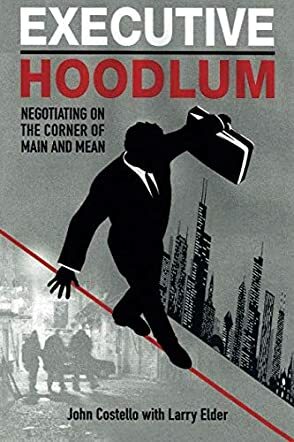 Executive Hoodlum: Negotiating on the Corner of Main and Mean was the perfect title for this fantastic read, and I would love to see more from this author in the future. He has a knack for bringing a real story to life in a way that readers will certainly relate to, with a message of values and honesty that leaves a good moral behind.